forte tea, originally uploaded by shaunaforce. The rain has returned to Seattle. All autumn long, the Chef and I have woken up every morning, kissed each other, then looked out the window and said, How is it another blue-skied day? If we want to make everyone around us gag, we tell people it is because of our love. But really, its probably just global warming. Day after day, the sky stretches to the horizon with nary a cloud upon it. (I feel like a Romantic poet with that sentence.) We run in sunlight, shop at the farmers market in warm air, look out our living room window and see nothing between us and the Olympic Mountains. For months, every days has been a perfect, azure-skied day. It rains in Seattle. Not as much as people think (except for last winter, when it rained for 29 straight days, then one day of sunlight, then another 22 days of rain), but still, it rains. And you can tell a real Seattlelite by the way he reacts to grey precipitation falling from the sky. Anyone who glooms and glares? Well, perhaps you might want to consider living in Southern California, where the weathermen apologize when a drizzle stains the sidewalks a pewter grey for twenty minutes. Anyone who wakes to rain on the roof and says, Yay! Its back.? Well, he should probably stay. The other day, as we were driving to the restaurant, I pointed out the cotton-wool covering over the sky, the fog lowering down. What a grey day, I said. Its beautiful, said the Chef. Thats my boy. He sees the beauty in life, even in the grey-skied days. This week, the rain returned, with a vengeance. Fat drops dribbled across the windowpanes of everyones houses, determined to tell us they had outsmarted the blue sky. When I looked out the window the other evening, after writing for a couple of hours, I saw the entire street corner slathered in slashes of rain, torrents of water lurching into deep puddles. It hasnt rained like this in months. I find I write more easily in the rain. When its sunny and warm, I feel an inchoate guilt that Im not out there, experiencing the world. When its raining, I dont mind sitting in my little computer nook by the window for hours, listening to the sound of rain drops plashing on the skylights in the kitchen. The wind blows the trees around, and I feel safe inside. Besides, wet weather like this simply calls for tea. I could write an entire essay on the joys of afternoon tea. Not today. Instead, let me just say that sometimes there is nothing cozier than a grey day, a cardigan sweater, an afternoon to write, and a warm cup of tea in my hands. My latest find is this lovely tea, Tea Forte. When I first saw these in a gourmet kitchen store, I thought they looked a little precious. But last year, the parent of a student gave me a box as a present, a thank you for writing letters of recommendation. I drank cup after cup and grew addicted to the stuff. A few weeks ago, my dear friend Amal gave me another box, just when I had run out. As soon as the rain hit, I drew out the little silken tea infusers, and my trusty red kettle, and started making tea. 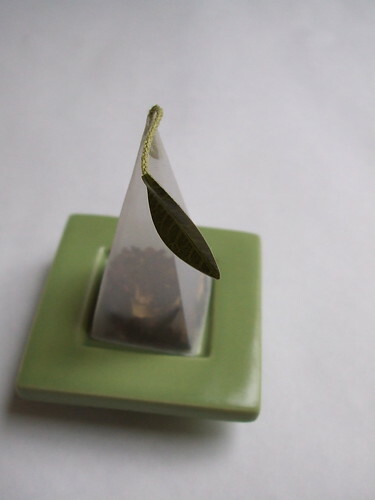 These little tea holders are much better than rough-hewn tea bags. I always feel a little guilty about making tea with a tea bag; I did live in England twice, after all. But these infusers push the tea leaves to unfurl and dance within the water, instead of being squashed up inside. Also, the teas themselves are just spectacular. Im partial to the Citrus Mint and the Bombay Chai, but the Earl Grey is quite good too. Flora is perfect for late-night writing jags. And you could never fill me with enough of smoky lapsang souchong tea. Why am I writing about this on a gluten-free blog? A few reasons. One, I love to remind myself  and all of you reading  that there are a plethora of truly exquisite gluten-free experiences available to us. Focus on what we can have, and the world opens up. The other is that I learned, early on, after cutting out gluten, that I did better if I bought myself a few treats along the way. A singular experience with a cup of tea makes a day without bread just fine. And besides, these just look too cool for me to resist taking pictures of them. A heartfelt thank-you to you and Dan for this lovely blue-skied autumn. Even the truest of true loves could keep the gray from Seattle for only so long. The rain beats on my window in wind-driven syncopation. The leaves dance off their branches and into the air. It’s a perfect Seattle November day. Shauna, have you ever tried Earl Grey and lapsang brewed together? It’s my very favorite–the flavors work perfectly with one another. Thank you for that sound poem. I know — I feel much more comfortable in Seattle in November in the rain. You have just created my next cup of tea! Well, great gluten-free girls think alike. I love a good rainy day, we got our first this past week but I’m still waiting for the first real storm of the season–the one that scours the windows. I live in one of the foggiest neighborhoods of San Francisco. A friend of mine recently told a friend of theirs that they knew someone who lived in the Sunset and loved the fog. “She must be a writer,” the friend replied. As for tea, yes please! Shauna – where do you get this Tea Forte and how exactly is it used? I love tea and heard a NPR program lately saying one should never use tea bags so I want to try something better, glad you liek the rain, keep up the lovely posts!